Our Adopt-A-Nest Program supports Nova Southeastern University’s oceanographic students and Broward County’s sea turtle conservation programs. 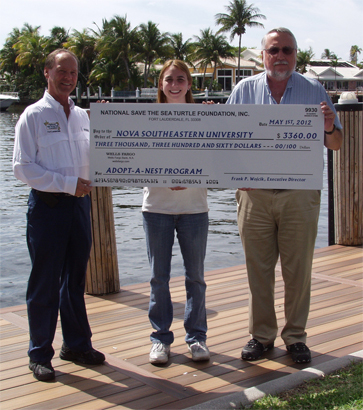 The Foundation’s Marine Biologist, Connie Versteeg and Donation Consultant, Wayne Kurian, presented a check in the amount of $3,360.00 to Nova Southeastern University’s Dr. Curtis Burney to support the sea turtle protection program. This is the Foundation’s 7th year to support the protection program with funds raised by the Foundation’s Adopt-A-Nest Program.